"Although his voting record is that of a mainstream African-American Democrat," Patrick McGuigan reports, Jabar Shumate "was targeted for defeat because of his steady and consistent support for parental choice in education." Good column this morning in The Oklahoman by state Rep. David Derby (R-Owasso) criticizing the rogue school districts in Green Country. If there's a legitimate problem with HB 3933, schools should voice their specific concerns when the Legislature reconvenes. In the meantime, schools should comply with the law on the books, just as the rest of us continue to obey the law and pay taxes that support schools even if we think tax rates are too high or superintendents are overpaid. In the future, there will be opportunities to amend the law and these districts will have a chance to take part in the process. There are better ways for schools to voice concern about a statute than break the law and harm families who already face enormous struggle and burdens. After all, Rep. Derby asks, "Why would anyone be against helping a student with special needs receive a great education?" Oh, I remember. It's because the bureaucrats just don't get it. The country has come to understand the wide range of teacher quality and its crucial link to school effectiveness and student achievement. Economic hard times are posing major challenges to state and local treasuries, of which huge fractions consist of public education, within which 75 to 80 percent of the money typically goes into salaries and benefits, mostly for teachers. Recession, unemployment, and the Tea Party have fueled an intensifying resentment of the privileged status of public employees, their job security, their (relatively) generous pay, and their lavish but sorely underfunded benefits, which threaten to place an unsustainable burden on future generations of taxpayers. We’re witnessing a gradual but nontrivial change in public perceptions of teacher unions and their power over the system. Educational entrepreneurship is our only hope for replacing the failed 19th-century model that now reigns in both public and private schools. But social conservatives, a key political constituency of America’s school voucher programs, always oppose designing those programs in a way that would empower entrepreneurship. They want to put more kids in religious schools, but not expose those schools to the competition entrepreneurs would create. But while competition makes people uncomfortable, it is the only vital, life-giving force that can keep institutions mission-focused and drive them to be their best. "If the NEA can fool Oklahoma voters into approving SQ 744, the game is on in the other 49 states," the Tulsa World editorializes today. "We'll have budget-busting, constitution-rewriting campaigns going from coast to coast, all designed to start an inflationary education arms race that will do nothing to improve the quality of public schools." Public education's productivity collapse has been nothing short of staggering, Andrew J. Coulson writes. Once upon a time, America could afford to sustain a parasitic school monopoly, fecklessly throwing billions more dollars at it decade after decade despite its failure to improve. That time has passed. Now that the economy is in a recession, the perpetuation of that monopoly puts our economic future at unacceptable risk. Many policy proposals are on the table that could inject market forces back into the field of education, bringing to it the same long-term productivity growth that has been the norm in other fields. Some states already have such programs operating on a tiny scale, such as Illinois' modest tax credits for families' own education costs, and the tax credits in Florida, Arizona, and Pennsylvania for donations to K-12 tuition-assistance organizations serving low-income families. The first states to combine and expand these programs on a grand scale will become magnets for businesses in search of better-educated workers and lower taxes, leading to an economic and educational boom. The states that don't will continue to burn in the budgetary hell created by monopoly schooling, needlessly jeopardizing their children's economic and educational futures. It's time to bring the field of education into the fold of the free enterprise system. Next Media Animation is a Taiwanese media company that is making a name for itself with video-game-style retellings, often hilarious, of American news stories, narrated in Chinese. Here's NMA's take on Waiting for "Superman", the new documentary on the failings of the American education system. Even if you don't speak Chinese, the two-minute clip sets out the key points of the school choice debate in memorable images. Come join us for a screening of The Lottery tonight at 7:30 at the Oklahoma City Museum of Art. Admission is free. After the film, Bob Ross of the Inasmuch Foundation will moderate a panel discussion featuring state Rep. Jabar Shumate, KIPP principal Tracy McDaniel, Oklahoma School Choice Coalition chairman Bill Price, and yours truly. Ever wondered what exactly it is the National Education Association is all about? Here's a handy summary to get you started. House Bill 3393, which was signed into law this year, provides scholarships for special-needs students to attend private schools. During floor debate on May 21, state Rep. Fred Jordan (R-Jenks) argued against the bill, voicing concerns about constitutionality, legal liability for school districts, and the financial effects on public schools. You may view the entire debate here. In the end, Rep. Jordan urged his colleagues to vote no on the measure, but "not because I don't believe in the idea and the program." Indeed, Rep. Jordan said, "I believe this is an idea we should pursue" because it's "probably a very good idea if it's done properly." To that end, Rep. Jordan recommended that his colleagues consider a similar scholarship program in Florida, which he said is "the model program." Rep. Jordan said Oklahoma needs to "do this thing right" -- specifically, we need to centralize scholarship-granting in the state Department of Education rather than requiring each of Oklahoma's 500-plus school districts to deal with it. As it turns out, Rep. Jordan was prescient. Now that a handful of local school districts, including Jenks, are choosing not to comply with the law, I agree with Rep. Jordan that "we've got to look at centralizing this thing in one location." Here's hoping someone will introduce legislation to that effect in 2011. 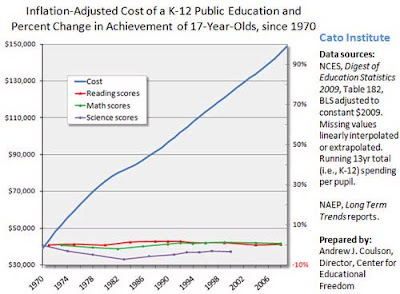 One of the most gratifying parts of Waiting for "Superman" -- a documentary made by a self-described liberal -- was the use of a chart which shows education spending going up, up, up while performance stays flat at abysmally low levels. It's gratifying because I've been using these charts for years. If the car has a blown transmission, it doesn't do any good to keep pouring more gasoline into the tank. Or as Jean Stover put it Sunday in The Oklahoman, "As a retired teacher, I would like to say pouring more money into a defective school system won't make it better." Yesterday I finally got to see Waiting for "Superman," and was one of a dozen panelists who spoke after a private screening of the documentary at AMC Quail Springs Mall. I strongly encourage you to see the film and to take action. Also, let's send the babies home! No child 4 years old or younger should be in an institution of formal learning, but rather at home doing the things little kids do. Public school teachers shouldn't be paid for babysitting at taxpayers' expense. If parents deem their 5-year-olds ready for school, appropriate testing should determine whether they can begin first grade. No more kindergarten! This would allow many more children to remain at home for that crucial year of maturity without feeling compelled to go with the status quo. I agree. Heritage Foundation researcher Lindsey Burke correctly calls government preschool "an expensive and unnecessary middle-class subsidy." American Enterprise Institute scholar Douglas Besharov worries that "preschool will become a new middle-class entitlement" which shortchanges the poor. As much as I would love to "send the babies home," a good first step would be to means-test the program. Just as it is wrong to provide Medicaid for millionaires (as The Wall Street Journal so lyrically put it), it is wrong to provide free babysitting for millionaires. At a time when Oklahoma policymakers are forced to make tough budget choices with your hard-earned money, means-testing preschool daycare is a good place to start. Once again I tip my hat to the Tulsa World editorial board for its firm stance against the Tulsa-area school boards who are disobeying Oklahoma's new special-needs scholarship law. Though it doesn't care for the law (it's "distasteful and bad policy"), the World very much cares for the rule of law. The newspaper's suggestion today is excellent. 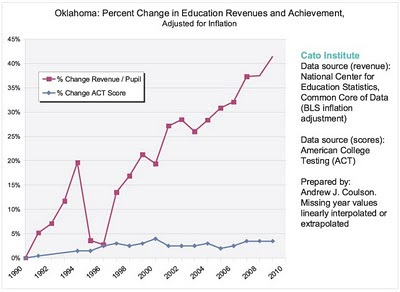 "Arguments used by supporters of State Question 744 mirror those used 20 years ago in support of House Bill 1017, which poured massive amounts of money into our common schools," writes OCPA adjunct scholar Russell Jones, a marketing professor at the University of Central Oklahoma. Before taxpayers decide to approve SQ 744, they should ask what we got for our money. During the past 20 years, we built more buildings, developed more programs (such as full-time kindergarten and pre-K), hired more teachers, and reduced class sizes. We also hired more administrators at handsome salaries. What we didn't get are more properly educated graduates. Forty percent of applicants for admission at state colleges and universities need to take remedial courses. If the top 40 percent of our high school graduates apply for college admission and 40 percent of them need remedial work, how badly educated are the students in the bottom 60 percent? Recently released U.S. Census Bureau data for March 2009 show that Oklahoma has 111.56 percent of the national average for elementary and secondary school employees. How can our education leaders justify asking for more money when it's obvious that the system has failed to produce acceptable results? How can they justify hiring more employees when they're already overstaffed? Perhaps we should scrap the current system and start over. Kay Harley is an attorney for the state Department of Education. Has she ever encountered a situation in which local school districts have chosen to disobey a state law? "Not in the 31 years that I’ve been working in education," she says. Congratulations to Susan Paddack, a candidate for state school superintendent in Oklahoma. She has pulled off quite a feat. She has managed to out herself as more committed to the failed status quo than even Barack Obama and a local labor union boss. But of course, as the following charts make abundantly clear, (1) we have been throwing more money at it, and (2) we don't like what we're getting. We can't spend our way out of it. I think that when you look at the statistics, the fact is that our per-pupil spending has gone up during the last couple of decades even as results have gone down. “It’s a sad day for public education," says Tulsa attorney Bill Wilkinson, who has practiced education law for more than 40 years and represents several Oklahoma school districts. If there was ever a time in the history of our state that public schools need support from the public, it’s now. ... [N]ow, of all times, is not the time for the school districts to do something to shoot themselves in the foot. But they have, just as the greedy Oklahoma Education Association has done with its scorched-earth 744 campaign, alienating friend and foe alike. In which of the following instances do certain Oklahoma teacher unions and administrators favor giving public dollars to private organizations? Education attorney Bill Wilkinson, who represents other school districts in Oklahoma, says the Tulsa Public Schools and other districts that have decided not to comply with the law have completely mishandled the situation. He says they may actually be shooting themselves in the foot. "They should have immediately employed their attorneys to file a petition for a declaratory judgment," Wilkinson said. "They didn't do that. Instead they said 'we don't like the law, and therefore we are not going to follow the law.' It angered a lot of people. But most important I think it angered some judges." Wilkinson says that while he agrees House Bill 3393 is not a good law, he says the fact that the districts have, in his opinion, angered several judges they will have a harder time winning any lawsuits. State Rep. Jabar Shumate (D-Tulsa) believes the Tulsa Public Schools should obey the law which grants scholarships to special-needs students. Keith Ballard, who pulls down 21 grand a month, worries that obeying the law "will divert sorely needed dollars" away from the Tulsa Public Schools. As I never tire of repeating, the bureaucrats just don't get it. We find the local public schools' stance on the special education vouchers amusing. We have had three children go through public schools, one of which was disabled and required special education. We only wanted the best education for our children. At Broken Arrow, we donated time, computers, and programs to his class, only to find them still in the box at the end of the semester. We moved three times, at great expense, because the districts blocked requested transfers to keep their hands on the money, which wasn't finding its way to our son. We finally found a school system in Union that wanted to provide a quality program and wanted to see our son excel to his potential, instead of providing the state minimums. It is amazing how different neighboring districts can be. We were happy to see Superintendent Jarod Mendenhall move over to Broken Arrow and replace the old era, now Union is joining the crowd out of fear. Who cares if this is a gateway to open vouchers? If these schools invested as much time and effort in providing quality programs and a real interest in their students, they would have people flocking to their districts. But instead, they are doing everything they can to imprison families in their districts with no choice, instead of setting goals of excellence. It's no wonder people are demanding alternatives, but that may be OK. We certainly have enough districts in Oklahoma to choose from. Come join us for a screening of The Lottery at 7:30 PM on Wednesday, October 27, at the Oklahoma City Museum of Art. Admission is free. In an interview with CapitolBeatOK last week, Superintendent of Public Instruction Sandy Garrett said public school board members in four different northeast Oklahoma public school districts are defying implementation of the new “Lindsey’s Law” assisting special-needs children. When I took office as Superintendent of Public Instruction, I swore an oath to obey federal and state laws. I have sought every day to uphold that promise. Whether or not I like a particular law is not material. It is my job to obey the law and to implement it. The way I look at it, the local officials on these boards of education who have acted not to comply, or to prevent implementation of this program in their districts, are not fulfilling their duties. I believe they are in violation of their oaths of office. This law was passed, and implemented in a timely manner by the state. To be clear, in my work every day there are laws I don’t necessarily agree with but which am required to carry out. State Sen. Patrick Anderson, a mild-mannered Republican from Enid, has compared the movement against the new law to the “massive resistance” of the bad old days in the south, when several southern governors defied desegregation rulings. Some went so far as to “stand in the schoolhouse door” to keep black children from getting into the schools. The new law bears the name of Lindsey Nicole Henry, an infant daughter of Governor Brad Henry and his wife, Kim, who died of a rare disease two decades ago. It provides scholarships to disabled children, identified as having “special needs,” so they can go to the school that best fits their needs. It’s as American as apple pie. Garrett and Anderson deserve honor for fighting the good fight for these kids. The state's two largest newspapers (The Oklahoman and the Tulsa World) today urged the Tulsa school board to obey the law. Hats off to the Tulsa World for editorializing against the "willful disregard for state law" on the part of some Tulsa-area school districts ("Bad lesson," Oct. 7). Your stance is especially admirable given your strong disagreement, as a matter of public policy, with the law itself. To illustrate why civil disobedience should not be the first course of action, consider the following. Our state Constitution says that all people have an "inherent right" to "the enjoyment of the gains of their own industry." On the advice of my $250-an-hour counsel, I am persuaded that a 5.5 percent income tax violates this constitutional right. (Counsel tells me a 2.5 percent rate would be constitutional, but 5.5 percent is unconstitutional.) And because this inherent right is safeguarded in our state Constitution -- in the Bill of Rights no less! -- clearly this trumps a mere statute. Thus, I don't have to pay my state income tax. I hope some school officials will come visit me in the pokey -- assuming I'm not bunking with them. The debate continues to rage over State Question 744, a proposal which aims to improve Oklahoma’s public schools by giving them a lot more money. More money is not likely to help. School budgets have been ballooning for decades with no improvement, and empirical research confirms that more spending doesn’t produce results. But researchers have found something that works. In fact, it’s the one solution that has consistently proven to get results in improving public schools. It’s called school choice, and the empirical evidence for it has been piling up for years. The impact of school choice programs on public schools has been studied 19 times, by researchers at top institutions (Harvard, Princeton, Stanford, Cornell, the Federal Reserve, etc.) using high-quality empirical methods. Let’s stop right there. Even before we look at the results, that is a far more impressive body of research than any other education reform (accountability testing, merit pay, tenure reform, et al.) can boast. And would you believe that 18 of the 19 studies found that school choice improves public schools, and the one remaining study found no difference? Every study in Milwaukee has found that the city’s voucher program improved public schools. Every study in Florida has found that its two voucher programs and one tax-credit scholarship program have improved public schools. Every study in Ohio, Texas, Maine, and Vermont has found that school choice programs there improved public schools. And that one study that found no effect? That was in Washington D.C. And the really interesting thing is that the D.C. voucher program is the only school choice program in the country that deliberately insulates public schools from choice competition. The program pours extra money into public schools when students leave. Thus, students are denied the benefits of healthy competitive incentives that are improving public schools everywhere else school choice has been studied. So even that outlying study is the exception that proves the rule. We have one school choice program that doesn’t allow competition to affect public schools. And that’s the one program where school choice doesn’t improve public schools. It’s true that the benefits of school choice so far are not revolutionary. That’s because we haven’t been allowed to have a true, unfettered program that could deliver such results. If the tiny, overregulated programs we’ve tried so far have worked well, how much more would we get from universal school choice? School choice is now a permanent part of the education reform landscape, and the political conditions for taking it to the next level are only going to get better as other reforms continue to fail. Even now, the dinosaur media don’t shill for the unions anymore. And the social-justice crowd and others on the political left are repudiating the unions and embracing charter schools—a watered down, halfway house version of school choice. How do you think it’s going to go when they realize that even charter schools aren’t enough? School choice works. The evidence shows it consistently. Our taxes are too low! I'm willing to pay more! your superintendent's son, Matt Ballard, is an attorney with the law firm that is urging you to violate the law. I am concerned that this personal relationship creates a conflict of interest which may be clouding the judgment of the people that are asking you to violate this law. Bill Price believes it's time we take a look at "the high cost and secretive nature of large legal fees caused by school districts suing and being sued by others." School districts have spent significant taxpayer dollars fighting the charter school law in the courts, and a number have threatened to sue the state challenging other educational reforms. Other districts have failed to implement the Lindsey Nicole Henry Scholarship for Students with Disabilities Program, forcing parents of children with disabilities to sue them in order to enforce the law. This lawsuit abuse must end. We should put a stop to one state entity suing another and forcing the taxpayers to pay for both sides. At a minimum, a school district should pay a price for forcing parents to uphold the law. A school district should be required to seek an Attorney General's opinion before suing the state or paying attorneys to defend suits. Furthermore, there may be tremendous cost savings in having the Attorney General's office represent school boards in all suits. At a minimum, if a school board receives an unfavorable AG's opinion and still pursues or invites litigation against the state or others without cause, the district's state funding formula amount should be reduced by the attorneys' fees and cost of litigation. Make no mistake, a new day is dawning at NE 23 and Lincoln. Come January, Oklahoma could very well have a center-right government unlike anything in state history. Lawsuit abuse, especially the kind that harms Oklahoma's most vulnerable children, must end. Oklahoma state Superintendent Sandy Garrett is not impressed with the school board members in Jenks, Broken Arrow, Bixby, and Tulsa Union who are not complying with the law. "We have to have leadership interested in investing in our schools," Lt. Gov. Jari Askins said today, "because you only get what you pay for." Bill Wilkinson has practiced education law in Oklahoma for 40 years. He doesn't like House Bill 3393, which established the Lindsey Nicole Henry Scholarship for Students with Disabilities Program. "It's a stupid piece of legislation," he says. "It's terrible." But as Chris Wright reports, Mr. Wilkinson is appalled that some school districts are choosing simply not to comply with the law. Wilkinson says there's another option. The districts could have filed what's called a "Petition For Declaratory Judgement." He says that would have allowed a district judge to rule on whether or not 3393 is constitutional. Instead, the schools have chosen what he believes is a very slippery slope. "We can't deteriorate to the point where we can just simply say I like this law; I'm going to abide by it," Wilkinson said. Wilkinson also represents school districts across the state, and says he's strongly advising them not to follow the lead of the larger Tulsa County districts. Dr. Terry Stoops of the John Locke Foundation is not amused by the condescending paternalism of a certain Jenks bureaucrat. By the way, Lisa Muller, back up. Let's give parents some credit here. These parents have spent years caring for their special needs children, navigating state and federal special education laws, monitoring district services, and communicating with teachers and administrators. In other words, these parents have the knowledge and experience to make an informed educational choice. So why the sudden interest in constitutionality now? [State Rep. Jason] Nelson explained that in Oklahoma, public money already flows to private institutions for a variety of reasons such as to pay for foster care or health care. In fact, he said, before the voucher law was passed, many school districts already opted to place some students with disabilities at private schools that could serve them, including religious schools. said she requested a private school scholarship for her son because he couldn’t get the social-skills training or orderly, structured environment he needs at Lanier Elementary School. “We wouldn’t be wanting to leave if our children were getting what they needed to get,” she said. Amy Howard said she jumped at the chance to transfer her son to Town and Country School because in public school, she said, he was harassed daily, beaten by classmates with nunchucks — martial arts weapons — and even shoved against a wall once by a substitute teacher. Now that he is in private school, “he doesn’t cry when he goes to school. He doesn’t tell us he wants to kill himself anymore,” she said. Howard said she doesn’t know how she could afford to keep her son in private school if she doesn’t receive the scholarship money. “Why, if you thought it was unconstitutional, why didn’t you tell all of these parents before we enrolled these kids in schools?” she asked. Amanda Murrell commented on the legal advice the Tulsa and suburban school boards have each received on the issue from attorney Doug Mann, with the Tulsa law firm of Rosenstein, Fist and Ringold. Tulsa superintendent Keith Ballard helpfully informs us that, "philosophically, I do not agree with providing public dollars for private school tuition." Of course, philosophically, he is always free to quit his 21-grand-a-month job and try to get elected to the state legislature. Parents in Oklahoma are feeling shortchanged after their school districts say they will not follow through on special education scholarships provided for under state law. Anyone out there feeling particularly Tocquevillian today? Any philanthropists willing to step up to the plate and pay tuition while the political and legal drama unfolds? If so, please contact me at 405-602-1667. "I know Blake really needed this," said his mother, Ann Howard. Blake Robison has Asperger's Syndrome. He's comfortable here, after a nightmarish experience in a public school. "He was never called by his name but by a nickname that they gave him called 'Bleak," she said. "And he would answer, because no one would ever call him his name." Blake says he was bullied, by fellow students and even a substitute teacher. At Town and Country, he's made improvements.
" I joke around and tell my husband and family, that we want Blake here so badly, we would live in a cardboard box, on the side of the highway, because he is happy," exclaimed his mother. "I was an educator for 12 years," says Nancy Kimery, who removed her son from the Broken Arrow Public Schools this year. “I taught in public schools. I taught in Broken Arrow. I love it for children who do not have special needs. I have a daughter that’s in sixth grade in Broken Arrow. It’s just that my son is autistic, has Asperger's. And he wasn’t getting the services that he needed." The National Education Association runs a side business in which it partners with a non-union, for-profit school. H. L. Mencken is said to have observed, "When someone says it's not about the money -- it's about the money." Bureaucrat Jarod Mendenhall, whose school district is under investigation by federal, state, and local law enforcement officials, assures us that when it comes to denying special-needs children their rights, “It’s not about the money." "Parents of special needs students say they're appalled that several school districts are deciding not to comply with a new state law," Chris Wright reports ('Parents: Tulsa County Schools Turned Their Backs On Us'). Many parents have already enrolled their kids in private school, assuming they would receive the scholarship money. Now, they feel these districts have turned their backs on them. 11-year-old Jackson and 12-year-old Miles are doing something their moms say they rarely ever did before, they're enjoying school and they're learning. "He comes home every day and talks about his day," said Kimberly Tylycki, Jackson's mom. "He actually does his homework every day. He never did his homework in the public school system." "It's changed our whole dynamic as a family because he's now a happy student who feels comfortable in his own skin," said Miles' mom Michelle Eagle. Both boys have high-functioning autism. They are two of 135 students at the Town and Country School. All have autism, Asbergers Syndrome, or other learning disabilities. Seventeen, including Jackson and Miles, were enrolled after House Bill 3393 passed. Scholarship money or not, Jackson and Miles will be staying at Town and Country. Their parents say they've made too many strides to put them back in public schools. "Just the short time we've been here and our child's been here, it's worth it. If I have to work another job, my husband has to work another job, we'll do it. We'll make it work," said Tylycki. Parents get it. Too bad the bureaucrats just don't get it. the country needs "more great schools," whether public, faith-based, or independent. He noted that people sometimes like to pit public schools against private schools, but called such conflicts and distinctions "absolutely artificial." As a parent of a special needs child I am supportive of HB3393. I do think that optimally public schools should be supporting our special needs children but from experience I can tell you that it is a struggle to get services. I did express my concerns to my school board rep in Union and from the response I got it sounds like they will be joining other areas districts in 'ignoring' the law. It did seem to me that a good portion of the response that I received was drafted by attorney(s) that are evidently advising the board. I have now seen firsthand exactly what your campaign for HB 3393 is all about. … I was never aware of how serious these issues are for our delayed or special needs child until we had a son born with mild cerebral palsy. Since then I've sought out families across Oklahoma to learn more about their struggles with assistance for their children. What I've heard has been very sad. At three and a half years of age now, our son … has only attended public school here … for the past 6 months. It has truly been a disappointment and a very sad state of affairs to see how these children are victims of bureaucratic policies that would prefer to see kids wait until a "later date" to really address problems. Please believe me when I say that I could go on and one about what really happens in the public school setting at IEP meetings, and what does not happen in the classroom that should. The same people that claim how critical it is to get these therapies (OT, PT, and speech therapy) at the earliest stages of brain development are some of the same people that want to deny the children many of these "life" critical foundation therapies. My eyes have only been opened by parents of other children who are already years down the road in this process...it's very sad. It seems that the only way to get the school systems attention frequently is to mention due process... very unfortunate and wrong. … We're much too smart and educated in this country to let our children wither this way. Thank you! Thank you! Thank you! The statements you made regarding Jenks and Broken Arrow in the Tulsa World today are 100% correct! People in Tulsa and Jenks are too afraid to publicly speak out against Jenks and their treatment of the special education students! Jenks also has a reputation for interpreting the law so that they don’t have to offer services and/or water the services down so it is very minimal. They also are in violation of offering the same services to all students rather than individualized as required by law. Jenks spends an unbelievable amount of money to keep the law firm on retainer because Jenks does not follow the law. I wonder what the public would say if they knew how much of our schools tax dollars went to pay the law firm? If the taxpayers had a say in whether that money went to the law firm or the general education fund I know they would say the money should go to our kids! It is disgusting how much money the law firm gets. It is ridiculous that Jenks insists that they educate and care about their special education kids. Since we [have been in Jenks] my [child] has regressed two years. They have such low expectations and do very little to increase their intelligence and more to teach the kids "life skills." Please don’t let up on them! No matter how intimidating they are and the law firm is ... Jenks thinks they are God and above the law and everyone else in this town and so many people and businesses cower down to them all the time. They have the attorneys scare everyone. Everyone knows this but no one has successfully been able to do anything about it. THANK YOU! Today in The Oklahoman ('School boards display callous disregard for state law'), state Sen. Patrick Anderson (R-Enid) compares certain school board members to Gov. George Wallace. "I am stunned that these school boards would so blatantly and callously deny the families in their districts additional educational opportunities," he writes. Read the whole thing. Advocates of SQ 744 don't seem to realize that the educational landscape has changed; they continue to see public education in one shape, with everyone else seeing another. Proponents of SQ 744 see dollars first; opponents see reform first. Reform must come first and the dollars to support achievement must follow. As educators, we must accept the fact that reform is here and it is not going away. Demanding dollars without reform is a losing argument, morally unacceptable, and politically unattainable. There is an excellent -- and I do mean excellent -- house editorial today in the state's largest newspaper ('Tulsa-area school boards chose wrong path of protest'). "The blatant disregard with which school board members in Broken Arrow and Jenks acted last week in voting not to comply with a new state law is outrageous," The Oklahoman says. The Oklahoman's rebuke comes just a few days after the state's other major metropolitan daily, the Tulsa World, chided the school boards for being sore losers. "You've done a great thing in Oklahoma," Sarah Palin said last month in Tulsa, referring to a new law which allows parents of special-needs students to choose the safest and best schools for their children, whether those schools are government-operated or privately operated. Interestingly, Palin's remarks came just a few short weeks before some Tulsa-area bureaucrats made the rather startling announcement that they aren't going to comply with the law. A seemingly prescient Palin had noted that "instead of removing barriers and opening new paths of opportunity, it seems like, gosh, the bureaucrats just don't get it. Why make life any tougher or more challenging for these kids and for their families?" Why? Well, it's because bureaucrats love building fiefdoms, and they don't want any revenue units (a.k.a. children) to escape. 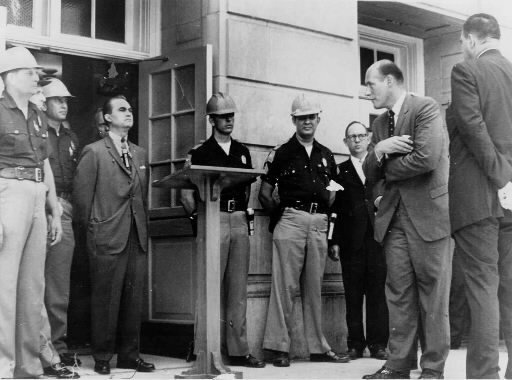 George Wallace blocked the schoolhouse door to keep students out; these bureaucrats block the schoolhouse door to keep students in. As law professor Andrew Spiropoulos pointed out, "they would prefer to be cruel to the most vulnerable children in our society than give up a dollar of their precious funding." Kirby Lehman is one of those bureaucrats who just doesn't get it. He complains that helping these vulnerable children would erode education funding, which he's against, given that it's already eroded to the point that he is forced to scrape by on 25 grand a month. Bureaucrat Jarod Mendenhall doesn't get it. He complains that "we don't have enough money to fund what we do now." Of course, what exactly it is they do now isn't entirely clear, which is why federal, state, and local law enforcement officials are investigating the school district. Bureaucrat Cathy Burden doesn't get it. Bless her heart, she doesn't see anything wrong with bemoaning the insufficient "commitment to education" being made by the taxpayers who pay her nearly $20,000 every month. And she does it in the same speech in which she acknowledges that these uncommitted taxpayers just provided her with "eye-popping" new turf for her football stadium! Bureaucrat Lisa Muller doesn't get it. She boasts that her school district serves special-needs students "very well," and indeed is renowned for it (which presumably justifies her compensation of nearly $8,000 per month). It doesn't seem to occur to her that if the district really is as good as she says it is, then obviously parents will choose it voluntarily. If the district is that good, why would it need to block the schoolhouse door to keep its students? And on it goes. Bureaucrat Debbie Burchfield (more than $9,000 per month) doesn't get it. Bureaucrat Roger Wright (more than $8,600 per month) doesn't get it. Stay tuned for more bureaucrats who just don't get it. "Every student, regardless of family income, is welcome to eat breakfast through the program." Shouldn't this at least be means-tested? Because unless I'm missing something, the federal and state governments are facing some fiscal challenges right now. The Tulsa World is no fan of scholarships for special-needs kids, but even the World agrees that refusing to abide by state law is a bad idea. Law professor (and OCPA adjunct scholar) Andrew Spiropoulos sums it up nicely: the Jenks and Broken Arrow school districts "would prefer to be cruel to the most vulnerable children in our society than give up a dollar of their precious funding." Autism schmautism. We've got priorities around here, mister. Members of the Oklahoma City Council are frustrated that MAPS for Kids hasn't led to major academic improvement. I know, I know. It's hard to believe that pouring more money into a heavily unionized, government-owned-and-operated system wouldn't result in better performance. "I am very saddened by the approach that the school districts have taken, in the fact that I believe it's a poor civics lesson for our children to thumb your nose at a law passed by the Legislature and signed by the governor. It's a very serious mode of operation they have chosen." "The ability of parents to cobble together a sophisticated education for their kids is within reach." This according to a prominent liberal analyst in Oklahoma. "An Oklahoma father who suffered the devastating loss of his 11-year-old son to suicide is trying to put a stop to bullying," CNN reports.